Sometimes it would be crates of oranges or apples. Other times, bales of unprocessed rubber or drums of cooking oil - wares that had fallen out of the net while being transported from cargo ships to the waiting bumboats. Those were the sort of cargo that would wash up on the shores of Pulau Blakang Mati - now Sentosa - in the 1950s and 1960s, and a teenage Masturi Lehwan would be waiting with his friends to scoop them up. 'Some of it would still be edible so we would eat it on the spot. The other stuff, we would sell to the karung guni for $1.50 or $2, which was quite a lot of money at the time... then we'd have a bit of extra to go to the cinema,' recalls Mr Masturi, now 58, with a cheeky grin that gives a glimpse of the youth he once was. Having grown up in a kampung on the island, he has witnessed its transformation from a peaceful, idyllic sanctuary to a modern enclave of theme parks, hotels and multi-million-dollar mansions. This year marks the 40th anniversary of the creation of Sentosa. His kampung - a collection of wooden huts and attap houses located at what is now Resorts World Sentosa - was made up of about 100 families. It had a provision shop, a barber, a tailor, places of worship and even a taxi service operated by a man known as Uncle Lai, who ferried villagers around in a cream-coloured station wagon. Whenever a trip to mainland Singapore was required, a motorised sampan or bumboat took them there for only 30 cents. At the time, Mr Masturi says, they shared the island with the Gurkha infantry units. Before that, the British army used it as the base of the Royal Artillery Garrison. 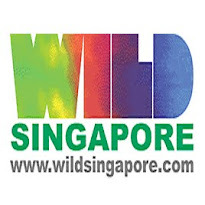 In 1972, the Sentosa Development Corporation was set up to develop the island into a tourist destination and attract more visitors to Singapore. A contest had been organised two years earlier to rename the island and reflect its transformation into a recreational resort. Five people submitted the name Sentosa, which means 'tranquillity' in Malay. Pulau Blakang Mati translates to 'island of those who die behind' - a reference to a malaria outbreak on the island in the late 1840s. Though the islanders were resettled in the Telok Blangah area by 1975, Mr Masturi never really left. A young man by then, he was working as one of the manual labourers tasked to build the island's new golf course. He is now the golf course supervisor at Sentosa Golf Club. His wife, Madam Asmah Aziz, 54, started work on Sentosa in 1976 as a guide on double-decker buses, keeping up a commentary for the tourists. She recalls that there were only three main attractions at the time: the Coralarium, which housed coral exhibits; Fort Siloso, a former British fortress, and the Surrender Chamber, containing wax figure tableaux of the British army's World War II surrender to the Japanese, and vice versa. There was also only one hotel - the Apollo Sentosa Resort. Former head of the Urban Redevelopment Authority, Mr Alan Choe, one of the board's pioneer members and its chairman from 1985 to 2001, said that the initial effort to turn Sentosa into a tourist destination was 'pretty basic'. 'The focus was on access to and around the island, preservation of the flora and fauna, re-adapting old military buildings to house attractions and creating interesting local attractions for visitors to enjoy,' he said. The creation of an island paradise went as far as transplanting 200 coconut trees from Punggol onto Sentosa to 'beautify' the place as such trees were not native there, The Straits Times reported in 1975. Under Mr Choe's watch, some of the island's most memorable icons came to life, such as the ferry terminal, the old monorail, the cable cars, the musical fountain, Underwater World, as well as the majestic Merlion tower. Other attractions have come and gone. Now defunct: Fantasy Island, the water park modelled after Typhoon Lagoon in Florida, and theme parks Asian Cultural Village and Volcano Land. Sentosa also hosted a rock gig by American band Bon Jovi, as well as performances by singers Rick Price and Jimmy Barnes in the 1990s. An Australian television series called Tanamera: Lion Of Singapore was filmed in 1989 in an old army barracks which is now the Capella Hotel's main lobby, and an episode of popular 1970s American detective show Hawaii Five-O was filmed on the cable car line. These days, the island is better known for its pristine man-made beaches and laidback beach bar culture. For years now, many revellers have made the pilgrimage to its sandy beaches to party the night away at ZoukOut. With the opening of Resorts World Sentosa in 2010, boasting a casino and Universal Studios Singapore, visitor numbers have spiked. Last year, visitor numbers hit 19 million - a 7.3 per cent year-on-year increase over the same period in 2010. The luxe factor was also upped with the building of Sentosa Cove, a residential area expected to have 2,000 homes by 2014. While Singaporeans are loving the bustle of the island, they do miss its quiet rustic charm. Still, for Mr Masturi and Madam Asmah, Sentosa holds only sweet memories. After all, it was where they met. Mr Masturi remembers how he would catch the tour bus after finishing his shifts so that he could catch a glimpse of Madam Asmah and talk to her. Later when they got together, he would wait for her to finish work and they would take walks by the beach and have picnics there. The couple married in 1979 and now have three daughters, aged 32, 27 and 23. 'Most of the bus guides were women and many of them were very pretty, but there was just something about her I liked... I think I made the right choice,' he says with a laugh. Pre-1970: Then known as Pulau Blakang Mati, the island was heavily fortified by the British and used as a base by the Royal Artillery garrison. During the Japanese Occupation, it was turned into a prisoner-of-war camp. It was also later occupied by the Gurkha regiment. 1970: Pulau Blakang Mati is renamed Sentosa, which means tranquillity in Malay. 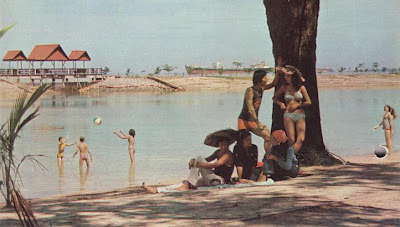 1972: Sentosa Development Corporation is set up to develop the island into a tourist destination and attract more visitors to Singapore. 1974: The $6-million cable car transport system that links Sentosa to Mount Faber on the mainland starts operating with 43 cars. The island's first attraction, the Coralarium (right), opens. It closed in 1995 and is now the Sentosa Cove arrival plaza. A swimming lagoon, now Palawan Beach, opens. 1975: Red-and-green double decker buses (below) are introduced to make it easier to get around the island. Fort Siloso, a former fortress built by the British army, opens as an attraction. 1983: The Sentosa Monorail is introduced. It ceases operations in 2005 to make way for a new light rail system after visitors complain that rides on the non-air-conditioned trains are uncomfortable, too slow and noisy. 1984: The famed musical fountain is launched. In 2002, it is replaced by the new musical water-and-pyrotechnic show Songs Of The Sea. 1987: The ferry terminal opens with its distinctive white facade and clock tower. Ferry services later cease and the terminal is demolished in 2007. 1991: Underwater World opens and remains one of the most popular attractions on the island today. 1993: The $60-million Asian Village, a theme park opens, but closes in 2006 due to poor visitor numbers. 1994: The $52-million water theme park Fantasy Island opens. It closes in 2001. 1995: Another theme park, the $20-million Volcano Land, opens but also closes in 2006 due to poor visitor numbers. 1996: The 37m-tall Merlion tower, complete with viewing decks, opens. 2000: The first ZoukOut is held on Sentosa, and draws 11,000 people. The beach bash soon becomes an icon, attracting revellers from all over the region. For its 10th anniversary in 2010, a record-breaking 30,000 people flock to the party on Siloso beach. 2007: The new monorail system, the Sentosa Express, is introduced. 2010: Resorts World Sentosa opens, which includes a casino and theme park Universal Studios Singapore. Singapore ... for diving - no, really!